Two going on twenty. 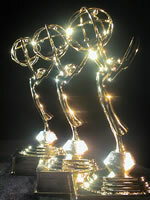 : And the Emmy goes to WTF?!?! Last night I didn't fall asleep until well after 4AM. I tried everything I could think to get myself to go to sleep. I was shocked by my insomnia since I had worked so hard on the apartment that my whole body ached. I started watching crappy 'Oh after dark' movies and writing trashy novels in my head. I decided that I was going to do it up right and write a book and call it "Journey to the other side of the bed" about a couple who have been together too long and lost touch with each other and themselves. A story of self-discovery and reinvention, and blah blah blah. I know, cliche, cliche, cliche, but at about 3:15 AM I thought it was brilliant! I still like the title, maybe I will write it into a poem. So what is up with the Emmy winners last eve? The Amazing Race trumps Project Runway? Monk trumps Larry David?? 24 trumps Greys anatomy??? Anyone trumps the actors from Six Feet Under????! I am convinced the Academy don't have basic cable. This is the only way I can explain this phenomenamenamenamena. All I have to say is: "It's Hard Out There For A Pimp"
Even the nominations this year were soooo suspect. You gotta give it up, though, for Tony Shaloub of "Monk"... he's so brilliant - in part because the role is. Larry David's not exactly the great actor, but that's not why we watch ;) He really deserves his own category of Emmy for what he does. The biggest crime was seeing Six Feet Under only get one (innocuous) Emmy (cameo - Patricia Clarkson.) Peter Krause waz robbed! I can't stand the amazing race though! And Project Runway is the bomb! As for 24, I guess I was over it after the first season. Jst a little too much "got 24 hours to save the world" and his daughter kept doing such stupid things I was wishing it was her and not the wife that got it at the end of the first season. When I found out she was coming back I said no way. The whole beginning of season 2 babysitting for the abusive guy story line was too much for me. I have never been back. I agree about the 6 feet under thing. They were robbed! I must really be losing touch with TV.........I didn't even recognize most of those titles!